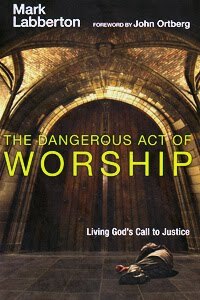 Perhaps the most thought-provoking and unsettling book I’ve read about worship is The Dangerous Act of Worship, by Mark Labberton (2007 IVP). The book jacket presents the discomforting picture of a desperate figure sprawled on the cold stone walkway outside a church, seemingly neglected, forgotten, and out of sight and out of mind from those inside – those gathered to worship behind safe thick walls and heavy closed doors. The author points out that while the believers inside those walls want to be separate from the world, they also claim to be called to worship a God that reveals himself as a God of great mercy and selfless, sacrificial love for all humanity – including (and especially) the powerless, the poor, the prisoner, and the oppressed. So Labberton challenges us to learn to “live with a wise openness toward others, finding ways of being available and alert and responsive” to those in need. Labberton says we can easily fool ourselves, and he challenges us to ask if we might be caught up in worship that makes us feel better but does nothing to help others who suffer – and goes so far as to ask if all our preparations for and participation in weekly corporate worship occupies so much energy and time that it leaves us too tired for ministry that might actually take us to where the needs are greatest? Are we so preoccupied that we lose sight of our being disengaged and disconnected from the needs of others? He tells of once watching an enthusiastic worship leader who closed his eyes, lifted his hands and sang and moved with such passion that he failed to recognize he was continually stepping all over the feet of those nearby. In worship, he had completely lost sight of his neighbor. But Labberton points out that in worship we are not only shown God’s will for ourselves, we are also shown our neighbor, and are urged to pray for, and to reach out and serve those in need. We are to be awakened to God’s heart for all. Vigorously honest worship, whether personal or corporate, is meant to be the primary love feast in our lives. It is meant to be the context where we experience being known and loved as we are. It’s meant to be the context where we affirm our home in God’s heart, seeing, tasting, hearing and sharing the love of Christ with one another. Out of this greenhouse of grace, we move back into the world in need of that love to which our lives are meant to bear witness (p. 181). Labberton directs us to Romans 8:38-39 and reminds us that…. …in worship we are given the perfect love of God in Christ, a home of grace that cannot be removed…. But the purpose, this side of glory, for dwelling in such love and finding it so profoundly strong and all-sufficient is for the assurance we have in giving it away (p. 182). There are a few sections of the book with which I may not completely agree, but still find quite thought-provoking. However one thing is clear. Life in Christ is not passive or self-centered. Labberton says that in worship the Spirit wants to wake us up and lead us away from safety and comfort, and rather than separating us from the world, provides us the freedom to be led into transforming engagement with the world that God loves.